Many of Custom Air’s residential customers may not realize that we also handle large commercial HVAC installations throughout Columbus and Central Ohio. Custom Air has 40 years of experience supporting Retail, Commercial and Service relative to the heating and cooling industry. Commercial projects remain a cornerstone of our business today. With decades of experience, our clients depend on us to keep their businesses running. 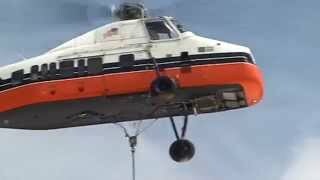 Watch how efficiently this Sikorsky Helicopter makes a rooftop HVAC installation. This particular installation was a 408,000 sq. ft. warehouse and office space in the Grove City area just south of Columbus, Ohio. “Using a helicopter allowed this project to be both efficient and effective for our client due to the logistical challenges of moving a crane for all the various positions on a roof this large”, said Steve Wisler, Commercial Division Vice President for Custom Air. We have partnered with Midwest Helicopter on many projects and they were our choice for this project as well. Our job was to remove the aging rooftop units and install new units. The new commercial HVAC units came equipped with the technological advances that were not available 15 years ago, which provides increased energy efficiency, more user control and extended life. On this particular job, Custom Air installed twelve (12) gas/electric rooftop units ranging in size from 3 to 25 ton capacity. Approximately every 4 minutes a unit was flown from the staging area onto the warehouse roof and placed on a designated structural pad. 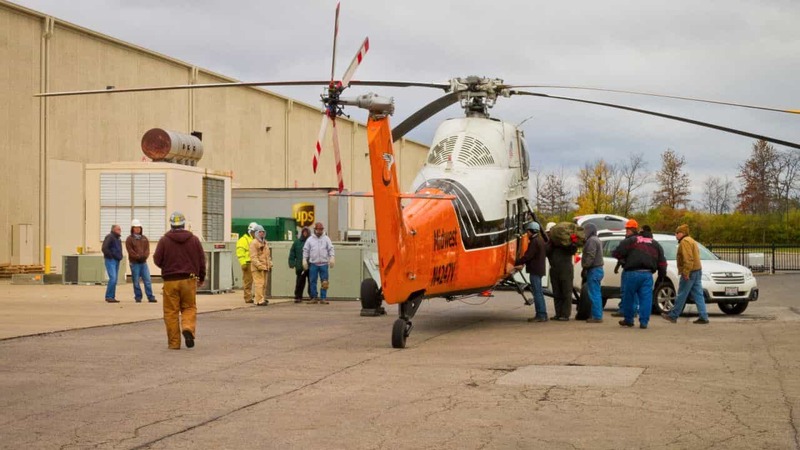 An orchestrated team of experienced Custom Air installers and the air and ground crews from Midwest Helicopter provided flawless execution. Also as a part of this project were ten (10) 50-ton capacity ground mounted package units replaced using a conventional crane. The Custom Air sales representative that managed this job is Darrin Lewellen, who has been with Custom Air for 20 years and has more than 30 years of HVAC experience.